Finch and his siblings, Lark and Wren, were born outside in May, 2017. These super-sweet kittens soon were swooped up by a Last Hope rescuer and went to the home of their foster mom, who kept them safe while they were socialized and had all of their veterinary needs seen to. While they were in their foster home, they received lots of attention, snuggling and playtime. The result is that they are some of the cutest, friendliest and playful kittens around! They are great with dogs and with other cats, too. 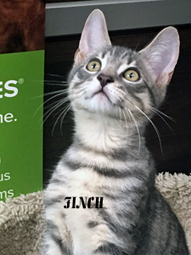 Finch, a beautifully marked grey tabby, loves to be with people who will play with him and, in quieter times, snuggle a bit. He’s looking forward to finding the loving family who will take him to his forever home! This entry was posted in Adopted, Adopted Cats, Cats, Male, PetSmart - Huntington Station, Under 6 Months. Bookmark the permalink.